Not feeling to well today, been up most of the night. What a time to get sick! Anyways hopefully the daily update will return tomorrow. As a experienced traveler in South East Asia, especially in Thailand, I have been fortunate to have sampled a number of locations in the area. I have lived in Thailand for the last 18 years and have traveled throughout the Kingdom to the north, south, west and east. It is very difficult to state which part of the country is my favorite, as each part has it’s beauty and reasons why they may perhaps be at the top of my list. However, one area that I really enjoy visiting is Kanchanaburi. It’s location steeped in history from World War 2, which is known to many and behind. A visit to the “Death Railway” is a must on any ones itinerary and of course the famous “Bridge over the River Kawi”. Thailand is a photographers dream, with a coastline that span’s around 2600km and 76 provinces there are many opportunities for quality pictures. Bangkok offers the photographer ample temples, the Grand Palace and for travel and street photographers a paradise to explore and have fun with interaction with the people. 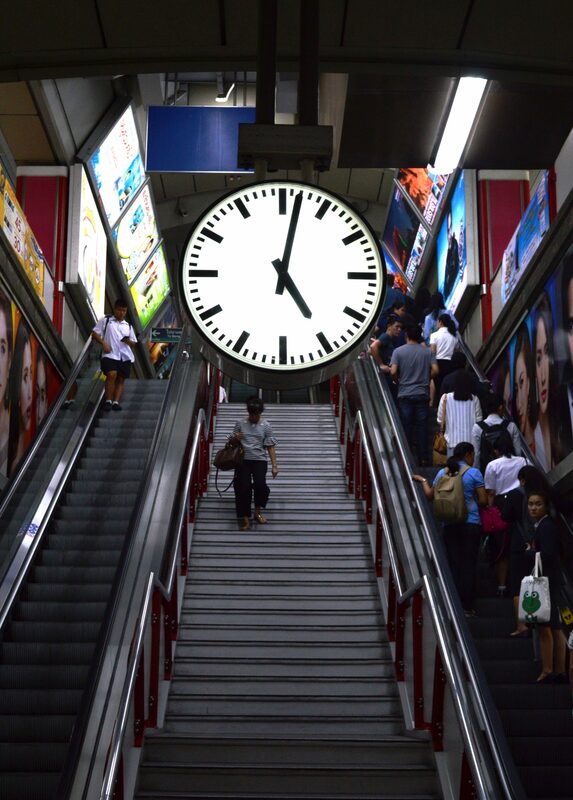 I enjoy my trips to Bangkok and have a developed a portfolio of pictures from the street. The Monk with a Camera, was captured during the annual boat race on the Chao Phraya River, Bangkok. A trip down the Chao Phraya River is another location well worth the time. Just a few weeks ago I spent the day traveling the river taxi, jumping off at different location with my camera at the ready for interesting opportunities to click off a few pictures. Admitting most were street shots and not in genre of travel pictures. However, a fun time can be add going up and down the river with your camera. A day trip to Ayutthaya is another location that shouldn’t be missed. The location is vast area of temple ruins in which photographers can use their imagination to capture truly marvelous pictures. At the northern end of the country we have the famous cities of Chiang Mai and Chiang Rai to explore. Chiang Mai has changed over the years, like many of the Thai cities and coastal areas with it’s emphasis on tourism, but traveling further into the hilly locations you can still find authentic hill tribes going about their everyday life. Taking a trek with a company will take you to the breath taking landscape northern Thailand has to offer. If you just want to take tourist snaps then near to Chiang Mai a village set up with hill tribe families at the ready for you to take pictures of themselves in the hill tribe attire. I have always been interested in photography most of life, and that is a long time, haha. However, it is only recently that I purchased a DLSR, in fact it is nearly a year since. Everyday I try to take pictures, I have read that the best way to improve is to shoot. With this thought I do my very best to heed the advice of these truly marvelous photographers. Photography has now become a obsession, in fact to the point, where my wife asks is your girlfriend coming along with us today, she is of course talking my trusty camera. Yes is the reply. So out she comes my Nikon D3200 on any trip or even down to local shops, just in case an opportunity arrives. My photography interests are in sports, street, people and portrait. My job is a Physical Education teacher at a International School, so I have a opportunity to shoot when the school teams are playing against other schools from the area and practice taking shots. Anyways let’s get to the title of this post. What is Street Photography? What I have read, there is a number of definitions and the way photographers view street photography. Is it an invasion of people’s privacy? Could be! My own definition of street photography is being on the street taking pictures of what ever you find interesting. You are not in a studio, or in the middle of a landscape surrounding. So perhaps being on the street is the answer to what is “Street”. As I continue to develop has a photographer being on the street taking pictures helps my photography. The speed at which you have to react to differing situations, checking the settings for the ever changing light and the composition in the frame. All these factors indeed keep you on your toes, so to speak. Is there any part of street photography that could be called street portraits?Just taking people’s portraits on the street. Maybe this could be called “Street Portraits” or maybe “Candid” is the correct term? I sometimes ask the subject or maybe I’ve started a conversation then asked to take their picture. Perhaps Eric Kim of Eric Kim Street Photography sums up the definition of “Street” by stating that the genre is made up of a number sub domains. I hope you don’t mind me using you Eric in my blog on Street Photography? Another point I would like to cover is that of settings on the camera, should you use manual, aperture or auto priority, should street photography be film only? If you are into street photography take a look at the video “Everybody Street” it is very inspirational and is a must for any potential street photographer. Another day of the road trip. My daughter was not feeling to well today, so the planned adventures was cut down to a visit to the beach. Managed to get along to Nopparat Thara Beach. The beach is very much a locals meeting point at the weekend. I went along on Sunday and the beach was packed with families enjoying the ocean, picnicking and relaxing under the cover of the tress, just off the beach front. At low tide it is possible to walk out to a nearby island at the one end of the beach. The beach is over 3 kilometers. I saw no deck chairs or sun lounges, so if you go along take your own chairs, towels and beach mats. At the other end the scenery is more picturesque with a cliff and a number of long tail taxi boats taking tourists to the nearby Ao Rai Lay beach. Getting to this beach is by boat only, however, it is well worth a visit. 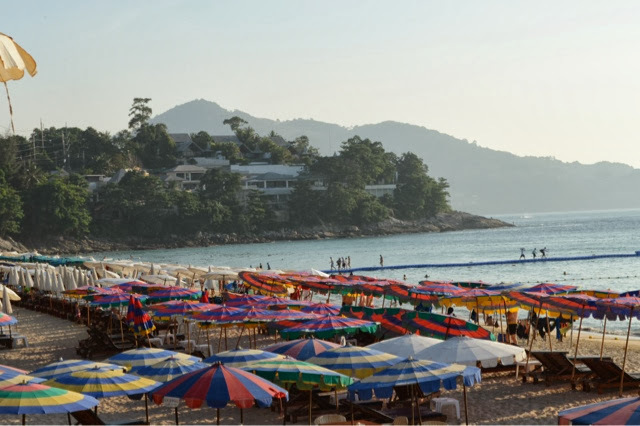 Taxi boats can be taken from Ao Nang and Nopparat Thara Beach. Not sure on the cost these days, as most prices have changed since I last visited the area. Will check it out and put it in a future post. Traveling on Highway 4 towards Krabi the marvelous views of the limestone mountains are truly out of this world. Once you hit PhangNa the scenery changes into a wonderland of beauty, with colors of red, orange and yellows of the rock face. Picture is straight out the camera without any PP. Making our way to our destination At Sea Condominium, Klongmoung Beach, the road is under construction and now means a bath for the car in the morning. If you are traveling to the area be aware of the road construction. Have not had much time to check out the area, will go out in the morning and give you a run down. But it looks promising. We took a trip to the nearby beach of Ao Nang, we stayed there many years ago when the beach road was just starting to develop. Wow what a few year makes, restaurants, bars and the usual street hawkers trying to make money from the tourists. For dinner we went to an Italian restaurant La Luna managed believe or not by yes Italians. The service from the staff was excellent and all were very a tentative. The Pizza’s were massive and excellent value for money. I recommend this restaurant, take a trip down and give the pizza a go. Further blog on the adventures tomorrow with a review of beaches etc. Well last day in Phuket before heading towards Krabi for the next stage of our Christmas Trip. Have loads of pictures, once I have PP them a little I will upload and make has a gallery. Krabi I is around one and a half hours away from Phuket. It is situated on the coast of Southern Thailand, surrounded lime stone mountains. We are staying near to Ao Nang beach, using the Airbnb company for accommodation. Once there I will update on the adventures of the Edwards Family, plus pictures. Woke up, made coffee, had breakfast and now working on what to do today. Decide to take a trip down to local pier, hopeful of a few pictures. Equipment: Nikon D3200, with the kit lens. Out by a pier on the east coast, a small fishing village. Local sea gypsy fishing repairing their boats, nets and waiting for the evening to get out there and earn some money. Taken a few portraits of some great people, I asked before I shot. 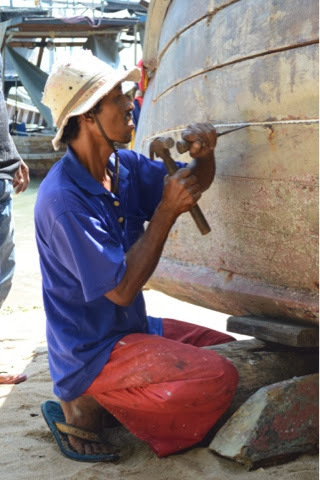 The fisherman repairing boat (picture attached) was more than happy to explain what he was doing. The job was to replace the string between the wood joints, this is to keep out the water. I learned something today about boat repair. Life is one big learning experience. Passing rubber trees along the way and pinapple plantations makes this trip an enjoyable experince. Phuket has many beautiful places to visit and plenty of photo opportunities. Touring around the north of the island we meet up with protesters in convoy. Managed to take a few photos. Stopped at Surin beach for a quick liquid refreshment at a place named Nok Seaford, right on the front with a nice view of the bay, before moving on. The beach is a mass of umbrella’s and loads of tourists enjoying the sun and ocean. Stopped off at the new Villa Supermarket at Boat Avenue to check out the store. Well that is it for the day, a successful day of photography.